For more shiny somethings, visit Strawberry on 34th Street. I love stores like Forever 21 and Strawberry for items like these, because you won't spend a lot of money for a fleeting trend. Mark my shiny words, next winter you'll have to call out reconnaissance troops to find a sequined tank top in the district. 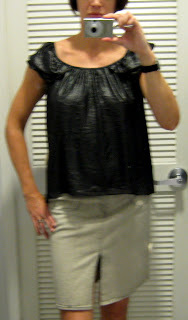 Very shiny top, left, $17.99, so pair it up with something low-key. Purple tank, $9.99, also comes in black, which might be cuter. And two shiny dresses, dark grey, left, and black, right, both for $24.99. Do these with a heavy stocking. I loved this Zara Women top (left, $35) so much more on; the fit is great. 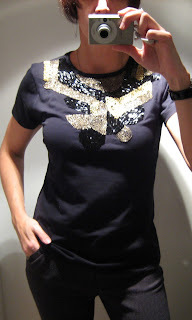 The beading, again, could work in a hip manner with a skirt or wait, cropped legging and ankle boot! 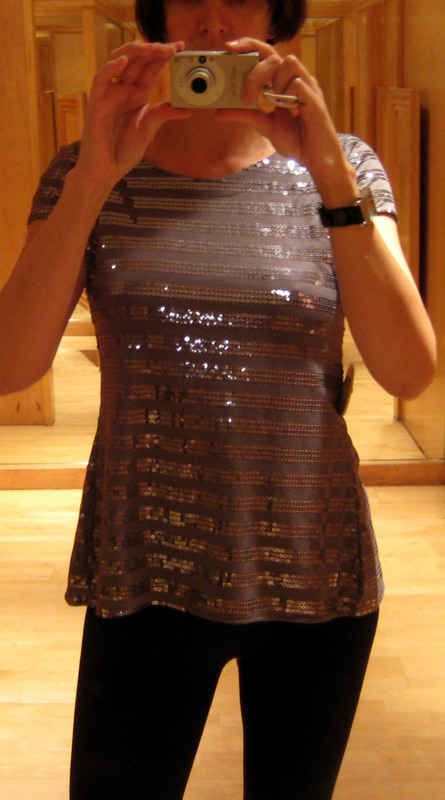 This top (right, $64) is on sale at Macy's (um, sheepishly I must admit on floor 2) and it is my favorite shine: rubbery looking shine. Very cool. The skirt is on sale also, a great Paper Denim Cloth number for $24.50, but I may have bought the last one. Sorry, its retro metal look was irresistible.